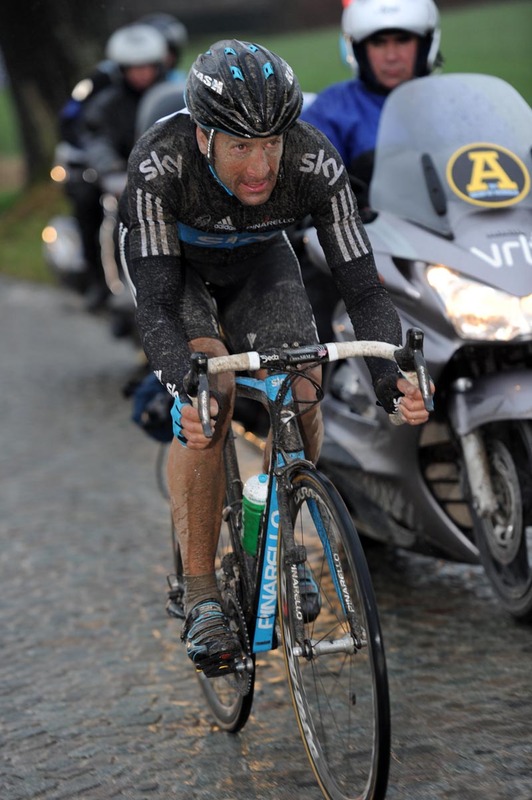 Team Sky’s Juan Antonio Flecha was narrowly beaten out of repeating last year’s victory when Rabobank’s Sebastian Langeveld won Het Nieuwsblad in Ghent this afternoon. The photo finish showed a margin of just centimetres after the two had battled out a two-up sprint at the end of an epically cold and wet 203km race. Although Spaniard Flecha had perhaps looked the stronger over the closing miles, he was unable to clearly come around his Dutch rival in the final 50 metres. At the line it came down to the lunge and Langeveld held his edge. After working hard for Flecha earlier in the day, Matt Hayman gained another podium position for Sky in third. He finished off Yoann Offredo after the pair escaped from the rest of the chasers on the run-in. The close finish topped an intriguing end to the traditional Belgian season opener – run over many of the same cobbles and hills as the Tour of Flanders. Langeveld escaped from the main group with 53km remaining, just after the day’s early break had been reeled back in. On his own, the 26 year old established a lead of over a minute, while a 12 man chase group detached itself from the bunch. 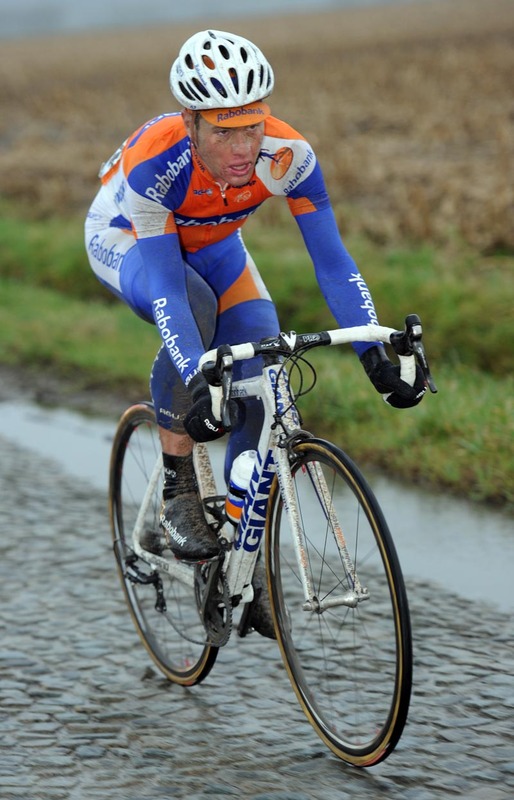 Amongst these were Flecha, Hayman, Offredo and Langeveld’s team mate Lars Boom. 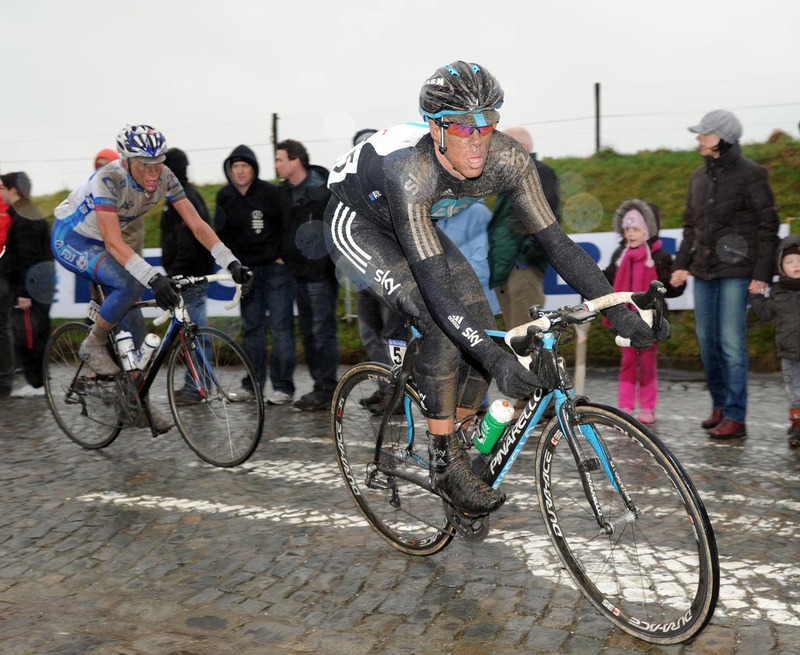 Other favourites such as Tom Boonen, Phillipe Gilbert and Thor Hushovd were left back in the peloton. After a brief tentative attack with 39km to go, Flecha made a more committed attempt to go on a solo chase with 28km remaining. He made his move on a rising stretch of cobbles after fellow chaser Martijn Maaskant (Garmin-Cervelo) went down in the gutter. Luca Paolini (Katusha) also got caught in the tangle. It took Flecha about 13km to bridge the gap, with Langeveld seizing the opportunity to ease off the gas a little as Flecha brought him into sight. With Hayman and Boom marking behind, the pair quickly secured a comfortable margin. With 5km to go, Flecha tried his luck with a spontaneous jump down the right. He opened some daylight through a couple of tight turns over slippery surfaces, but Langeveld was good enough to close it back up. Caginess ensued as the pair then stuck together towards the finish, the last kilometre being conducted like a track sprint. Flecha led for a large part of it, freewheeling along the right side of the road looking backwards, even hopping up the kerb at one point. The Rabobank man eventually took to the front and slowly wound up the sprint on the drag up towards to the line. Flecha came off his wheel and started to edge around his left. But Langeveld stayed strong and was just able to claim it. With an expected protest over rider radios called off this morning, the race went ahead without disruption. Hayman admitted a lack of radio communication had little impact on Sky’s race, although maintained they are a useful tool in other situations.